We spent the night in another DOC site at the end of Lake Mahinapua, near Franz Josef, home of its namesake glacier. It was really difficult to find in the evening. I had booked a Heli-hike up the glacier for the following morning and Claire was going horse trekking. We had a quick dinner and didnt bother with the whole bonfire thing as we were tired and wanted sleep. Good thing we did go when we did – we had only zipped up the door when the heavens opened, and stay up later neighbours were sent scurrying about the site trying to erect tents and pack up dinner as the rain lashed down. It rained all night. We got up early for the heli-hiking and horsing but we weren't expecting it to go ahead. It didn't. We were both delighted to have a lie-in back in the tent for a few hours with the pitter patter to seduce us back to sleep. There was about a 20 minute break in the rain which we used to take down the tent and get out of dodge. The rain was in the for the whole day so we decided a hostel would be a better option than a cheap 2 season tent. Chateau Franz was the perfect choice with a log fire and a big TV room with DVD collection both of which got their full use. Hiking on a glacier or horse riding would have been miserable anyway. The next day was glorious and the trips went ahead. Claire had great views of the glacier as she explored the countryside and nearly got thrown off a few times but managed to keep control. I had my first trip in a helicopter (MOT 30), weaving over the glacier to give everyone a good view. 10 minutes later we were in a different world. Just as we landed a snow avalanche made what they call locally “the black hole”, a rocky gap in the glacier, about 10% bigger. It was a world of blue and white crevasses and ravines, strange formations in the ice which we got to climb through. The blue tones of the ice are caused by the increased compression inside the glacier. We had about 2 hours on the ice before the helicopter came back to collect us. The pilot took a different route on the way back, not heading over the gladier but straight for one of the mountains. It seemed as if he would hit – he had to! With about 2 feet to spare he made it over and then put us into a stomach churning dive down the other side of the peak. The elderly English man next to me grabbed my hand suddenly but let it go once we levelled out. Helicopters are impressive machines. We turned in from the West Coast and crossed the spectacular Southern Alps at Haast Pass before holing up for the night in the pretty but exposed Mount Aspiring National Park. It was so cold I could barely reheat the pasta for dinner but Claire's by now well practised cold prevention routine was working well. Onwards to Wanaka, a town a few people had mentioned but no-one had been specific about. It has a magnificent setting surrounded by pretty peaks and on the shore of a pristine lake. We pulled into a commercial campsite near the centre of town with such luxuries as hot showers and cooking facilities. It was complete coincidence that the Upper Clutha A&P show was being held next door all weekend. We gave it a go the next morning. I reminded me most of the Dublin horse show and spring show that my mother used to take me to when I was a kid. There was a market selling everything agricultural outside and then various displays and stands on the inside, all surrounding a horse jumping ring. There were massive tractors and combine harvesters interspersed with sweet stalls and agriservices companies. We watched some rams being meticulously judged by an man in a trilby hat and meandered around the local school displays and competitions for best home distilled whisky or the finest marrow or the best photograph featuring “an elderly friend”. We sat in on a lamb cookery demonstration (NZ lamb tastes really amazing) and had some home made sausages and generally had ourselves a fine old time. One of the nicest things was that there didn't seem to be any tourists there – only locals. We took a walk up the lake shore in the fading afternoon sun before heading back to camp for some dinner. That evening we went out to see what Wanaka's nightlife could offer. A friendly Luxembourger, who bizarrely thought we were Austrian, shared an outside table with us at the first bar until we were cleared off the outside section and ushered inside. It was time to move on though, in search of some live music. The objective was partly met at the next place. A girl miming badly into a mic was the warm up “act” for a local band. Neither of us could work out why this had seemed like a good idea to anyone involved but it did provide some sort of entertainment, in the same way as watching You've Been Framed or anything else that relishes in the misfortune of others. The band, performing a Kiwi indie set, were pretty good. Nice to meet you, and I am Japanese, and the name is Fujimaru. I found "Heli-hiking, horse riding and a country " in the guide book of New Zealand. The wife and I plan to travel to New Zealand in November. 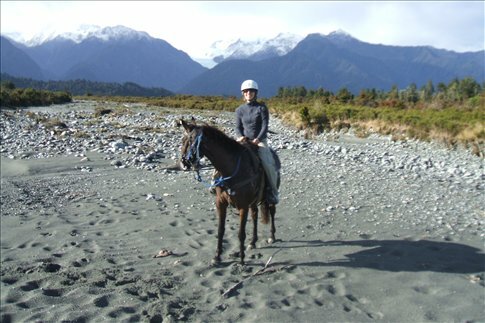 It rides on your horse, and we want to enjoy nature in New Zealand. 1.We have never rid on the horse so far. Of course, we do not know the method of controlling the horse. 3.We do not have clothes only for horse riding. Are it ..horse.. ridable we still? Please teach me the answer in mail.